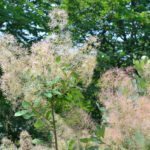 How long does it take for the blossoms to puff out on a smoke tree? My tree is full of small blossoms. Flowering on a smoke tree typically starts happening in June, so you should start seeing something within the next month or so.